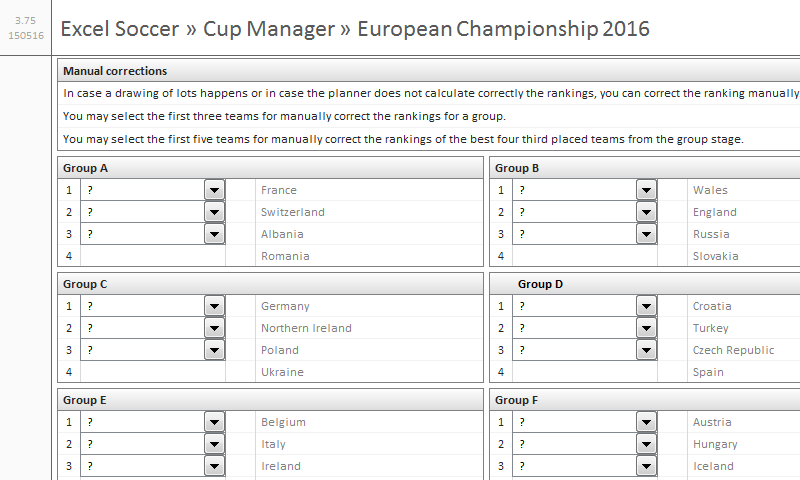 The Excel-Soccer Cup Manager is the fourth release of the proven World Cup and Champion Chip planner of the last years. 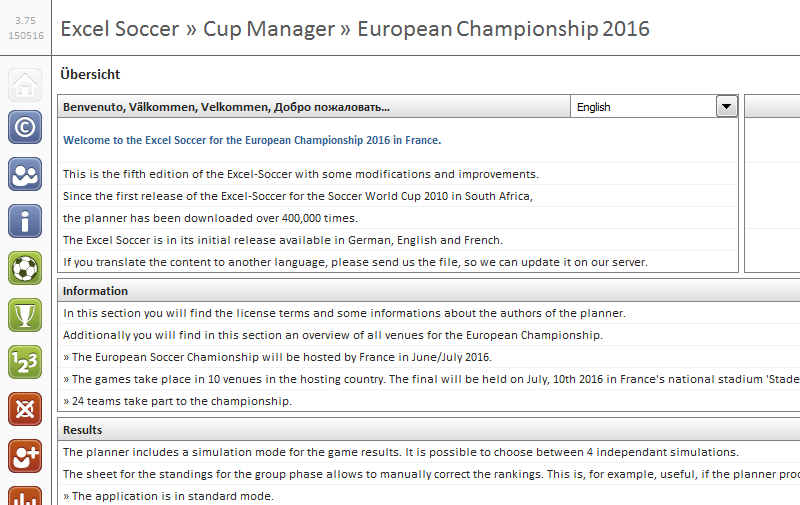 The Excel-Soccer is in its delivery state available in English, German and French. The Excel-Soccer Basic only uses Excel functions and no macros. The Excel-Soccer Basic is available for free and, additionally to the management of the matches and rankings, includes a prediction game with up to 128 participants. You can optionally distribute the particpants into 4 groups with each a maximum of 32 participants. Various settings allow you to fine-tune the application. In the following some instructions how to use the Excel-Soccer Basic and how the software works. 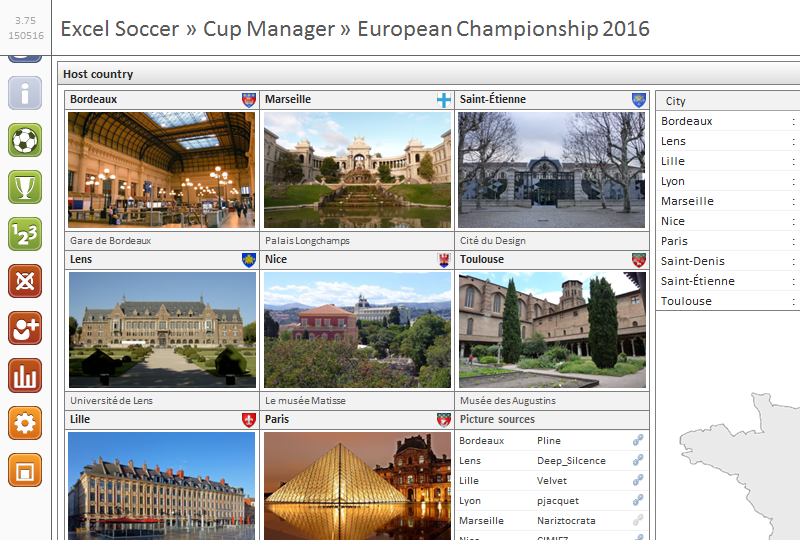 The screenshots are showing the current version for the European Soccer Championship 2016 in France. This version can be downloaded in the Download section. Click on the headings to view the content of the corresponding categories. The Excel-Soccer assumes that the license terms has been accepted. After opening the Excel file, you can find the license terms by clicking on the icon at the left side displaying a copyright symbol. The licence terms are also available on this website on the License page. The Excel-Soccer has been tested in Microsoft Excel 2010 and Excel 2013 for the languages German, English and French. As far as I know, the Excel file should also work in Excel 2007. Older versions of Excel are not supported – and will also not be supported in the future. Additionally, no tests were done with other spreadsheet applications such as Open Office. The download section offers three files to download. However, each download archive contains the same Excel file, but with the difference that they are respectively pre-configured in one of the three basic languages. After opening the file, you can also choose the active language on the start page. The Excel-Soccer takes account of a fallback language, which is used if a term and/or phrase is not translated to the active language. Please note, that the teams are sorted alphabetically in some lists. So, if for example you have already setup some participants in the prediction game and answered some of the bonus questions for the teams, it can happen that the choosen teams will be replaced by another teams when changing the language. Therefore, the language should be choosen before the real use of the Excel-Soccer. 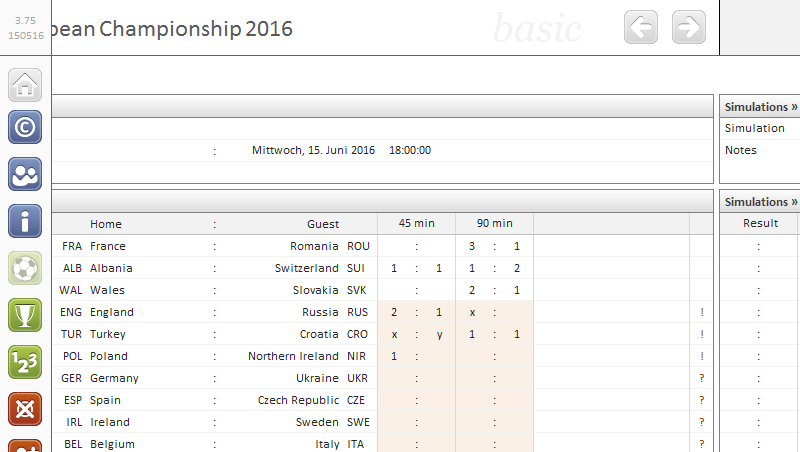 The Excel-Soccer offers an option for choosing your timezone, so that the matches a displayed in your local time. The option for the timezone is not active in the download file. Therefore, it is recommended to setup this option before the event begins. The Excel Soccer tries as much as possible to recognize erroneous data and to point out inconsistencies. In such cases, a message appears in the header of the current sheet. For missing or erroneous information on unlocked fields, such as for the match results or for the prediction game, an exclamation point or a question mark is shown next to the field. An exclamation mark is given a higher priority than a question mark. In the figure shown below, some game results have been entered incorrectly or are empty. The Excel-Soccer uses the system time to calculate if a match should have taken place. In such cases and if no results or erroneous data were entered, the fields are highlighted in red. In order not to destroy the integrity of the formulas used in the Excel-Soccer, avoid copying and pasting cells. Cut und paste operations can also lead to loss of functionality. If you want to insert content from other cells or another workbook, be sure that only the contents are copied and not the formatting. The Excel-Soccer offers a test mode for testing purposes. This mode turns uses the date and time values defined by the user instead of the system time. The option can be found in the settings for the Excel-Soccer. A date and a time are required to be entered in this mode. The sheet for the venues shows you an overview of all venues of the event and the matches for each venue. The missing matches are completed during the event, as soon as they can be calculated. The different phases for the matches in the knockout round are highlighted in different colors. One sheet is provided for entering the match results. The Excel-Soccer uses the system time to calculate if a match should have taken place or not. In the group stage, the calculation refers to the start time plus 90 minutes for calculating the ending time. You should at least enter the match result after 90 minutes. The half-time result is optional. In the knockout round, the 90 minutes result will be used if no result is entered for the 120 minutes or penalty shoot fields. 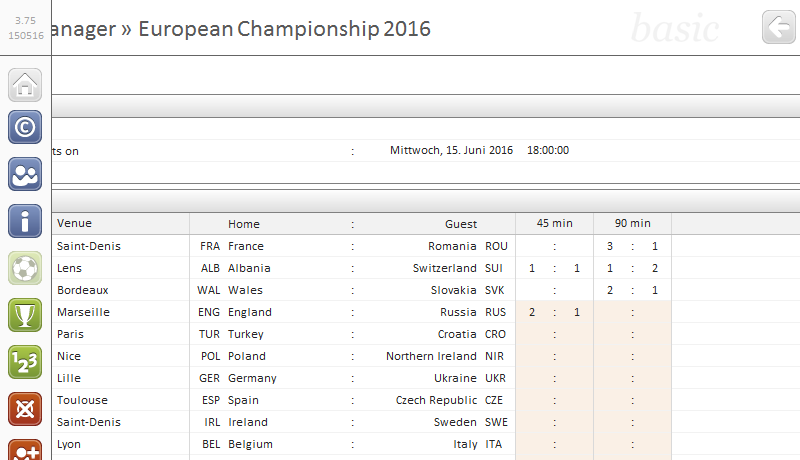 The Excel-Soccer offers you up to four simulations for the match results. These simulations are independent each one from another and if a simulation is choosen, the simulated results will be used for the calculations in the Excel-Soccer. At the bottom of the match results sheet, you can compare two teams. A chart shows you the goals for and against per team. The worksheet for the Group Stage displays the ranking of the teams in each group. As 24 teams take part to this event, the best four third placed teams are also taking part to the Round of 16. The ranking for the six third placed teams is shown below the rankings for the groups in an own table. The following rules are taken into account by the Excel-Soccer for calculating the rankings of the teams and the third placed teams. Please note, that this version of the Excel-Soccer does not support a direct comparison of the teams. Number of points for the Group Stage matches. Goal difference for the Group Stage matches. Number of goals for the Group Stage matches. The same rules as above are used for the calculation of the rankings for the third placed teams. The matches for the Round of 16 are calculated by using the following keys. For example, the key ABCD means that the third placed teams of the groups A to D qualified for the next round. In case a drawing of lots is necessary to determine the rankings or in case the Excel-Soccer does an error when calculating the rankings, you have the option to manually correct the rankings both for the groups and third placed teams. When doing a manual correction for a group, you should choose at least the first three teams in that group. If you manually correct the third placed ranking, you should choose five teams. This version of the Excel-Soccer allows a maximum number of 128 participants to the prediction game. You can optionally create a maximum of 4 groups and distribute your participants in these groups. Please enter the participants to the prediction game in the corresponding worksheet. The abreviation is normally automatically calculated by using the first letter of the first and last name. However, some combinations are not allowed and replaced by another one, such as Susi Sonntag or Karl Zimmer, which lead to unfortunate abreviations – especially in Germany. The answers to the bonus questions can also be given in this sheet for the particpants to the prediction game. The answers are independant from the settings of the prediction game, meaning, if the bonus questions are disabled, the answers are not taken into account. The predictions of the results for the matches can be entered in a separate worksheet. The Excel-Soccer tries as much as possible to point out errors. If a match has taken place, the Excel-Soccer calculates the points obtained by the particpant. 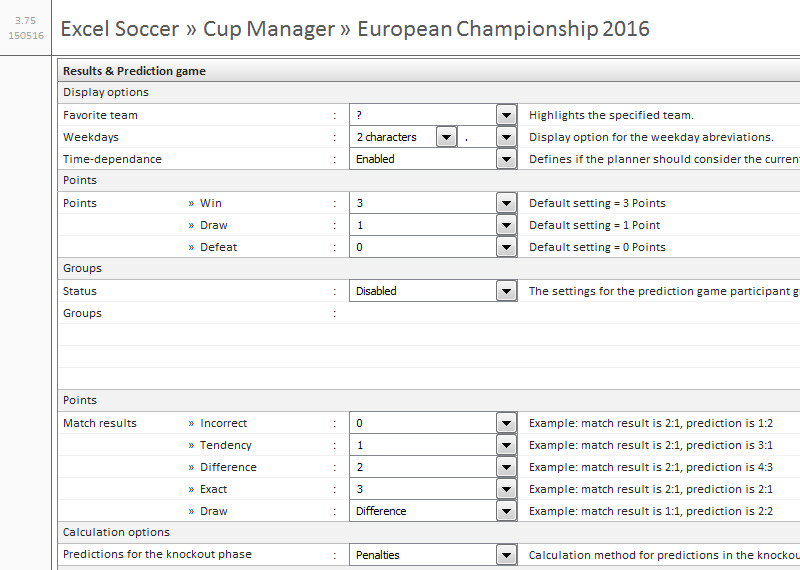 As this version of the Excel-Soccer does not contain VBA-Macros, the field for the predictions are not locked after a match took place. Exact The match result and the prediction are equal. Example: match result = 2:1, prediction was 2:1. Difference The difference of the goals for the match and the prediction are equal. Example: match result = 2:1, prediction was 3:2. Tendency The winner of the match has been predicted. Example: match result = 2:1, prediction was 3:1. Draw Depending from the settings, the points for the difference or tendency are given. Example: match result = 1:1, prediction was 2:2. Incorrect None of the previous cases applies. Example: match result = 2:1, prediction was 1:2. The report for the prediction game includes a graphical visualization of the rankings for the participants. 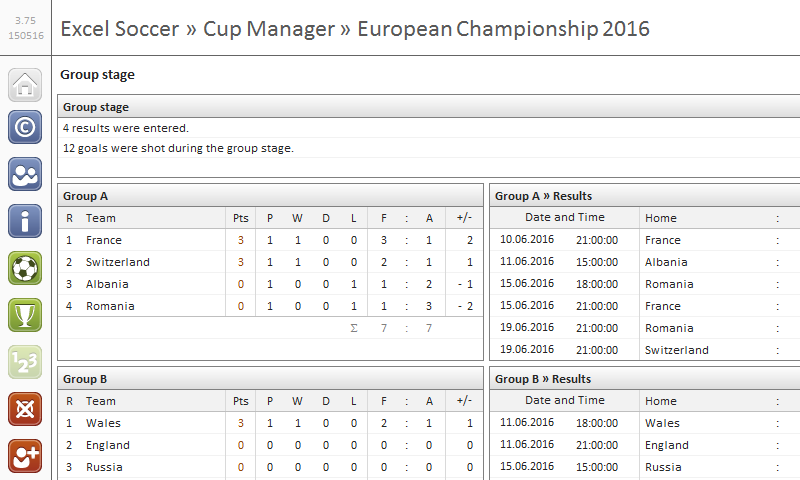 You can filter the data, for example for displaying only the predictions for the Group Stage or with/without the bonus questions. At the bottom of the sheet, you will find charts showing the accuracy of the predictions made by the participants. Number of predictions for the correct match result. Number of predictions for the difference. Number of predictions for the tendency. Bonus points, depending of the current phase of the World Cup. The settings sheet offers you various options to configure the Excel-Soccer for your needs. You can, for example, choose a language, a time zone, a favourite team, which is then highlighted in the matches, setup the points for the predictions and bonus questions and many more. Additionally, you can define two user defined bonus questions. 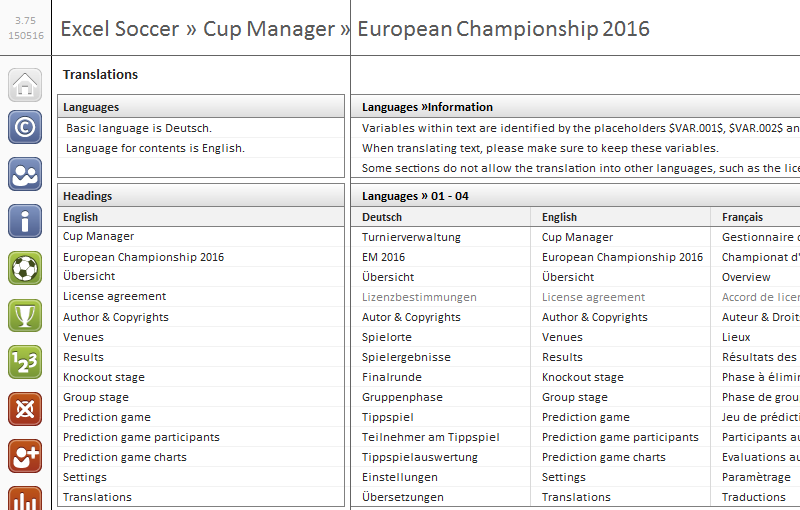 The sheet for the translations includes all texts and identifiers needed by the Excel-Soccer in different languages. However some cells, such as the cells for the copyright and license, can not be overwritten. Translations to user defined languages should be made in this sheet. If you translate the Excel-Soccer to another language or correct an existing translation, please send me your work by e-mail to translation (at) excel-soccer (dot) de so that I can add your data to future releases of the Excel-Soccer.